It all started way back in the mists of time (at around 4.30am when my alarm went off). I felt very bleurgh and was rather unsurprised to find that star week was upon me, what a lovely way to start a day. I did at least have company on the way in as I was giving Hague a lift, but once he'd gone it was time for work, and I couldn't have been less in the mood to be there. The machines seemed to feel the same way, and were playing up something chronic. Constantly stopping and just generally being a total pain in the arse. First break couldn't come quick enough (again). I'd taken lots with me, as always for a long shift, but fancied the pineapple early on - something sweet to try and put a smile on my grumpy old missog! I really didn't want to head back down to the Machines of Doom, but needs must, and so back I went - at least I had TOK on the other end of the magical email tubes - although we both had a case of the grumps, misery really did like company today! My next break was an extra one, something that could have made me happy if it wasn't for me seeing my manager whilst I was in the tea room, and him informing me that I'd have to attend a disciplinary meeting regarding my absence. Just the thing to cheer you up eh? ...and carried on through the rest of the first part of my shift. The temperature managed to reach 26 degrees today too. It was only when my trainee (not my trainee anymore but still hugely annoying when your machines are playing up and he's making stupid mistakes) had gone home, and I escaped for my second meal break that my mood started to lift. Talk of purple unicorns and booking holidays for the much anticipated TOK/WLB/Me meeting/fabulous girlie weekend had started to cheer me up, as well as hearing some wonderful news of an impending wedding of two friends. I was still tired, still crampy and still a tad grumpy, but I was feeling better, and as the clock edged nearer to freedom, the machines settled down too - at long last! My final break was short and sweet, but helped to ease the last hour by. Much as talking about badger costumes, and emailing about smiley moments DID actually cheer me up a bit, there is nothing like the feeling of escaping work when you've had a really crappy day, and boy did it feel good today. My journey home was punctuated with texts from Sacha and Hague telling me how they got on at weigh in - another crapola thing about today, no weigh in - both had fab losses, and Hague got his 3 stone award too! So proud of them both! Anyway, the last vestiges of the grumpiest of all the moods disappeared as soon as I saw Hague, and then got on the right side of a lovely big cup of tea whilst he sorted out dinner. Although the broken egg sort of proved that today was really the kind of day I should have spent under the duvet! As you all should know by now, I'm a girl of huge portions and much as my dinner was delicious, it wasn't quite enough for me and so I topped it up with another plate of noms, using up pretty much all of my syns! A slice of toast, topped with cherry toms and my HeA of cheese, along with fruit, can't scrimp on the super free! With plans afoot for an early night and lots of cuddles ahead, I think we can safely say today will end better than it started. Things could be worse. I could not have a job. I could not have a Hague, and marvellous friends who emailed and tweeted and messaged me to cheer me up. I could still be off work with the debilitating stress and depression which haunted me up until not that long ago, I could still weigh over 25 stone. I should really try and count my blessings a bit more often when I'm having a day like this. 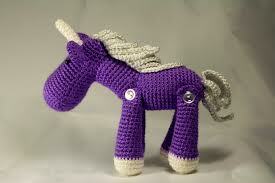 And I should also remember Purple Unicorns. For how can you not be happy in a world with purple unicorns whose legs are attached with buttons? Mother Nature arrived with her bags packed at my house yesterday too, unannounced and definitely uninvited! Hope you have had a better day today.